As Christmas approaches, I want to take a moment to reflect on what Christmas really means. Earlier we wrote about the Christmas Truce of 1914—an unofficial ceasefire in which Allied and German soldiers fighting in World War I joined together to celebrate Christmas. Another similar event occurred 30 years, on Christmas Eve, 1944. Fritz Vincken, a young boy, was spending Christmas with his mother in a cold shack in the Belgian Forest. Allied troops had invaded Normandy the previous summer, and the Battle of the Bulge was in full swing. On this cold, winter night, Fritz said a knock came to the door. His mother opened it to find three American soldiers lost and looking for a warm place to stay. 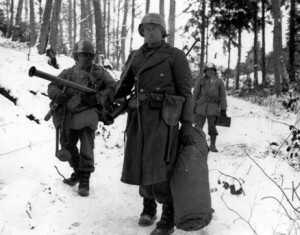 Although Fritz and his mother were German, they invited the young men inside to warm by their fire and share dinner. A short time later another knock came. Four tired German soldiers stood in the doorway, also looking for a warm place to stay. Andy Griffith passed away more than a year ago, but his memory lives on every day as his TV shows and movies are aired all over America. The iconic “Andy Griffith Show” is one most of us remember watching while growing up. The first season the show was on featured a Christmas special. In the episode, local department store owner Ben Weaver—a crusty, old curmudgeon—insists Andy jail a man over Christmas. Andy, Barney, Aunt Bee, the prisoner’s wife and children, and others end up spending Christmas Eve in the jailhouse, celebrating together. By the end of the episode, the department store owner is so touched by how happy everyone is, he has a change of heart and joins everyone celebrating Christmas.